A few useful bits of information about Sanxenxo. If you want a quick summary of what Sanxenxo has to offer, both as a holiday resort and a town, read on. 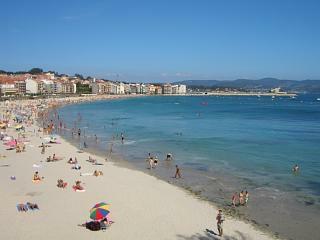 Sanxenxo has 2 main beaches, one slightly man-moderated and the other more natural. Both are stunning, popular and filled to over-flowing in the month of July (the Spanish national holiday month). The bay area at this resort enjoys some of the warmest waters in all of Galicia. Some claim that it has a micro climate that sees it get more hot sunny days than the rest of the region. The entire area around this beach meca is full of outstanding beaches and numerous former fishing towns that make nice places to visit. 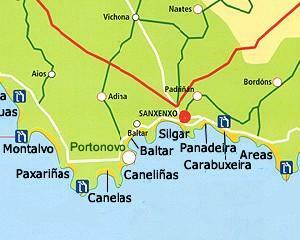 The city of Pontevedra is close by making it an ideal location for a long or short break in Galicia. 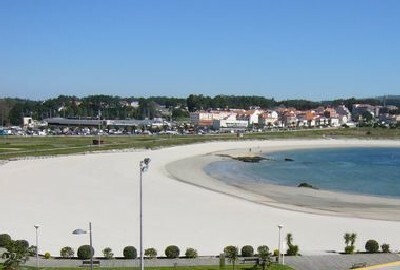 The busiest time to visit Sanxenxo is in late July and August when this normally semi-deserted town is full to the brim of Galician tourists. Many actually live less than 25km away, but spend their summer vacations in holiday apartments purchased before the price boom started. Other than a couple of great beaches, up-market hotels, an ideal location and a better than average Galician climate, Sanxenxo has little to offer - but those things alone really should be enough! (For any Galicians reading that comment, it is intended as humour, so do not take offence and please do not email us about it). Given it high prices, is Sanxenxo internationally cosmopolitan? Certainly not, it remains the haunt of many Galicians and an increasing number of Spaniards travelling from the south (although many of these have their origins in Galicia). Most of the holiday activity takes place during the Spanish vacation month of August, but things may change in the future. However, for now Sanxenxo is still definately in the category of "unspoilt Spain". There is an official website for the district of Sanxenxo and you can visit it by following this http://www.sanxenxo.org/ link (SORRY NO LONGER ACTIVE). There is a Union Jack icon that takes you to an English language translation, but this is one of those universal web translator's products and as such it makes little sense. Left, this curved bay backed by hotels is what makes Sanxenxo so popular. Personally we prefer the more natural Galician beaches that you access via a wooden boardwalk, but each to his or her own.